Everyone has a past, but David Loogan’s is darker than most. The year is 1998, and Loogan -- the crime magazine editor at the center of Harry Dolan’s critically acclaimed novels BAD THINGS HAPPEN and VERY BAD MEN -- is twenty-six. He’s living in the city of Rome in upstate New York, under the name he was born with: David Malone. On a rainy night in April, a chance encounter on a lonely road draws him into a romance with Jana Fletcher, a beautiful young law student. Jana is an enigma: living in a run-down apartment with only the barest of possessions, sporting a bruise on her cheek that she refuses to explain. David would like to know her secrets, but he lets them lie -- until it's too late. When Jana is brutally murdered, the police consider David a prime suspect. As he clashes with Frank Moretti, the lead detective on the case, David sets out to uncover the truth about Jana. He soon learns that her death may be related to an earlier murder, one that she was obsessed with during the last weeks of her life. And as he retraces her steps and talks to the people who knew her best, he begins to realize that he's treading a very dangerous path -- and that her killer is watching every move he makes. 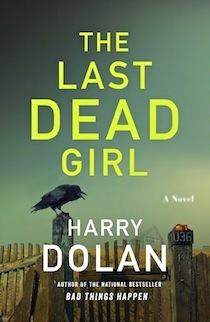 David Loogan (born Darrell David Malone), the self-appointed investigator in Harry Dolan's absorbing, exciting "The Last Dead Girl" will be familiar to the author's readers from two fine earlier books set in Ann Arbor, Mich., and featuring the same protagonist. This third chronicle is a prequel to the best-selling first one ("Bad Things Happen"). Set in the 1990s, the new book recounts the fatal, haunting events that caused Malone to change his name and occupation and move to a different state. Back in 1998, Malone is working as an independent building-inspector in Rome, N.Y. Driving on a rural road on a rainy night, he encounters a young woman whose car just struck a doe. The deer survives, and its rescuers' chance meeting becomes an affair. But the woman is soon murdered. A distraught Malone is determined to find her killer. The solution lies in dreadful happenings from the victim's recent past—secrets uncovered in the course of an intricately constructed book that switches between Malone's narrative voice and several other points of view. The more we learn, the greater the suspense. "The Last Dead Girl" has a large and diverse cast—a law professor with whom the victim was working to overturn what she thought was a wrongful murder conviction, that convicted man and his extended family, a pair of evil cousins with possible ties to the problematic case, and the cop who warns Malone about playing detective: "You need to think about whether you're taking this too far. You're living in a dead girl's apartment." It's 1998, and David Malone is living in his home town, Rome, N.Y. Professionally, he inspects houses for potential buyers; romantically, he's engaged to a medical student. But one evening she confesses to a fling with another man, whereupon Malone walks out and within hours is romancing law student Jana Fletcher. Alas, after he's spent 10 blissful nights with Jana, someone kills her, and Malone finds himself being questioned by a detective who'd happily pin the crime on him. Thus begins Harry Dolan’s third novel about David Malone, although the first two, the highly praised "Bad Things Happen" and "Very Bad Men," took place a dozen years later, when Malone was calling himself David Loogan and working as a magazine editor in Ann Arbor. The essential fact about Malone/Loogan is that, whether he's 26 or 38, living in New York or Michigan, he has a gift for attracting women and trouble. . . .
Malone's first-person account of his investigation sometimes gives way to a third-person look at the killer, a psychopath who calls himself K. . . . The elusive K is probably one of the characters we've met [elsewhere in the novel], but figuring out which one is tricky because Dolan has a talent for ingenious, serpentine plots. . . .
Malone is a likable fellow, his romantic tribulations ring true, he quotes good poetry, and we cheer his determination to find Jana’s killer. This is a world in which people smoke weed, bum cigarettes and cheat on their spouses, a world in which popsicle sticks become important clues, and Malone recalls the boyhood pleasures of catching fireflies on summer evenings, even as the killer conspires to catch him. "Set in 1998, this prequel to 2009’s Bad Things Happen puts Dolan’s gifts as a storyteller on full display. Series hero David Malone (who later becomes David Loogan) finds himself sitting in the Rome, N.Y., police station, the prime suspect in the investigation into the murder of Jana Fletcher, with whom he recently began an affair. David soon learns that Jana was involved with the Innocence Project, an organization committed to freeing the wrongly accused. Believing Jana’s murder to have some connection with her investigation of Gary Dean Pruett, a man convicted of killing his wife, David searches out those involved in the Pruett case for answers. Throughout David is secretly followed by K, an elusive, homicidal deviant who wants to stop David from discovering the truth. That K doesn’t just kill David right off doesn’t really make sense—after all, he has few qualms about murder—but if you can look past this detail, you’re in for a suspenseful ride." "When 26-year-old David Malone stops to aid Jana Fletcher at an accident scene, his life changes dramatically. He spends ten days, and nights, with the mysterious young law student, and then she is brutally and ritualistically murdered. Naturally, he is a suspect but not yet charged. Jana had been passionately involved in the Innocence Project, seeking to free a local high school teacher convicted of killing his wife. David decides to pursue this case on her behalf. Through “interlude” chapters we learn about Jana’s earlier harrowing ordeal, the anonymous killer’s mind-set, and more murders. "The twists and turns flow effortlessly. . . . Dolan’s writing is excellent, and readers can look forward to his future efforts the way millions of us look forward to the ever more superb novels of Harlan Coben, Michael Connelly, Jonathan Kellerman and Sue Grafton." "One of Dolan's gifts is creating capricious and flawed characters who are nevertheless sympathetic. Jana is so well fleshed out and her life so tragic, her death is deeply felt. The tale is told in a nonlinear manner, with time jumps and interludes; the style is effective because it allows Dolan to keep shocking truths hidden until they're ready to be revealed." "Let me start this review by saying that this is going to be one of my favorite books of 2014, it’s that good. It’s a prequel to BAD THINGS HAPPEN and VERY BAD MEN which feature David Loogan. THE LAST DEAD GIRL is set in 1998 when David used his original last name, Malone. It’s a twisty plot that kept me guessing. Let me see if I can do it justice without giving anything away. "David is seeing a woman that he met under strange circumstances after she hit a deer. Jana Fletcher is a law student at a local college. After only being together a couple weeks she is murdered and of course David is a suspect. Against conventional wisdom he ignores detective's advice and starts digging around trying to figure out exactly who he was involved with, and what he discovers keeps opening up more secrets. There is a killer on the loose keeping an eye on David and others, the cops still want him in jail, and his ex-fiancée doesn’t know what to believe. "I kid you not when I say I read this in one sitting. I could not stop. Every time I thought there was a point when I could put it down another revelation kept me reading. The pacing isn’t all that fast, but the suspense build up throughout the book is relentless. Upon finishing I kind of sat with my mouth hanging open and actually said 'wow' outloud. "This powerful entry in Dolan’s spectacular David Loogan series is riveting and emotionally draining. The dark and disturbing story leads to a forceful and touching conclusion. Events occur so unexpectedly that they hit readers like a punch to the gut. Dolan’s writing is superb. He’s a master of crisp prose, dialogue that rings true and characters who seem totally real. If you like character-driven, suspenseful mysteries, you’ll love Dolan." "The Last Dead Girl, the prequel to Harry Dolan’s critically acclaimed Bad Things Happen, plucks an ordinary guy from an ordinary life and draws him into an amateur investigation of his lover’s death. . . . The result is a tense and involving tale, with quite a number of surprises along the way." "With The Last Dead Girl, Dolan takes the reader to places much nastier and more heartbreaking than any he has shown us before. And he unspools Jana’s story slowly and carefully, using all the thread. Loogan’s backstory is compelling, but her past holds secrets that are truly haunting." "[THE LAST DEAD GIRL] is one of the greatest novels we have read in a while . . . A stellar piece of work . . . This is a series which we highly recommend to all lovers of crime fiction." "Dolan plays out the complications with a spider’s patience." "THE LAST DEAD GIRL is one of the best books I have ever read . . . Harry Dolan has a way of giving away just enough but never too much so that the story remains a compelling mystery from the first page to the last. He also writes in a fashion that holds the reader enthralled. I simply had to know what was going to happen next, which kept me moving quickly from chapter to chapter. "THE LAST DEAD GIRL . . . will stay with you long after that last page is read. It is a book that I wanted to keep going and, even now, I miss that I don't have another chapter to read in it. David Malone is a character that you cheer for and encourage along the way because you want him to get justice for Jana as well as unravel the other mysteries that surround her. In short, I loved THE LAST DEAD GIRL!" "The pace is brisk, the characters vivid, and the narrative chronologically complex but beautifully executed. What might be implausible, hackneyed, or over-dramatic in other hands works brilliantly, because Harry Dolan is a fine writer who knows how to take familiar elements and make them fresh."